From Chopard and Rolex jewelry boutiques to Roberto Cavalli on the beach! It’s a shopper’s paradise; where else can you shop at 23:00? An island that never sleeps! Day and night, Mykonos glitters like a finely polished jewel. 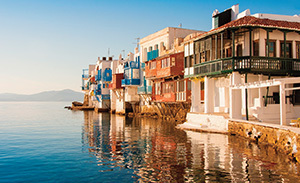 Movie stars and magnates mingle with weekend clubbers in Mykonos Town’s warren of white-washed passages as casually as the shiny yachts bobbing on the surf next to the brightly painted fishing boats strung with yellow nets. An island of opposites, the austere lines of its traditional architecture conceal opulent interiors of holiday villas owned by jet-setting pop stars and millionaires. The social whirlwind of the beach parties and nightlife vibrates against the tranquility of remote, secluded coves. The frenzy rhythms of the famous cosmopolitan bars and clubs of the island may carry you away in an endless spree until the rising of the sun. There are no strict dress code rules as to end up dancing in some of the historic clubs of Chora with your swimsuit and sunglasses! Mykonos Island Greece is the perfect getaway: somewhere you can find yourself as easily as you can lose yourself in the crowd. And there’s only one place where these two worlds meet: Mykonos Blu. Set on a bluff overlooking the gold-tinged sand of the world-famous beach at Psarou, the resort is perfectly poised between the island’s two worlds – secluded, yet close enough to town for you to join the party minutes after the urge strikes. A very beautiful old island town, which in the past had its own merchant fleet.